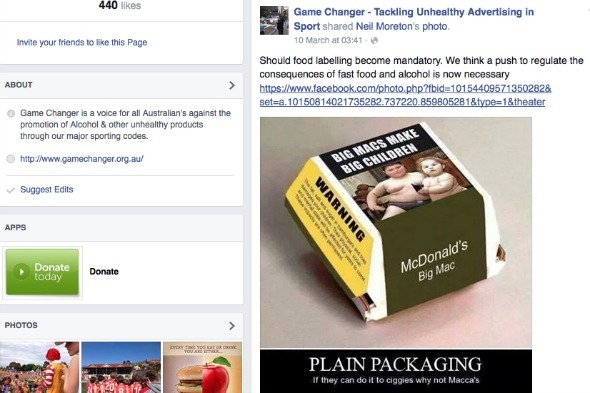 Aaron Shultz, an Australian health campaigner, is calling for plain packaging featuring health warnings for junk food. He has posted a picture on Facebook of what he believes the packaging could look like - dropping the branding in favour of a picture reminding people of the price they could pay for a junk food habit. Shultz is a health campaigner, who runs an organisation called Game Changer. It has a broader aim: to halt the promotion of alcohol, junk food and gambling through sport. He argues that by associating sport with these unhealthy brands, it normalises junk food, and contributes to the growing obesity problem in Australia. He wants to see brands add a detailed list of ingredients to their packaging, with a long-term aim of introducing plain packaging - to halt the influence of brand power on children's food decisions. The expansion of plain packaging beyond tobacco products has been something that analysts have talked about since plain packets were first proposed. An Adam Smith Institute report by Christopher Snowdon recently claimed: "The extension of plain packaging to other products is not just possible, it is highly likely." He added: "What happens to tobacco today tends to happen to other 'unhealthy' products tomorrow." He cited sin taxes, advertising bans and health warnings as proof that "we can be confident that the temperance lobby and the diet police will fight for it to happen with plain packaging." Snowdon is a pro-smoking author and journalist, so the idea of extending plain packaging brings him concern, but it will cheer health campaigners. They point out that packaging has a profound influence on children's food choices. In a 2007 study in Maryland, researchers gave 63 preschool children two sample meals from McDonalds. The first was left in McDonalds wrapping, and the second was put into a plain wrapper. Most children said they tasted a difference between the two identical meals, and most said they preferred McDonalds - 76% said the fries in the colourful bag tasted better. The idea is that part of the reason why children want unhealthy food is because they have already bought into the brand. Without the branding, it could lose some of its appeal. However, the UK government has already stated that it sees plain packaging for tobacco as a one-off. The Department of Health made it clear that the 'uniquely harmful' nature of tobacco means it can be treated differently from any other product, and it has no plans to extend standardised packaging to any other product. But what do you think? Should plain packaging and health warnings be introduced on junk food? Let us know in the comments. Downside of convenience: what's in that ready meal?